The last time I went to Cenart, a large arts centre in the south of the city, was almost exactly a year ago, when we'd just arrived in Mexico. Then it was to see a concert by the Philharmonia. Tonight it was pretty much the opposite: the opening of Transitio MX06, a biannual digital art exhibition. We'd helped with the UK-based artists. Boredom Research are Paul Smith and Vicky Isley who do very 'sciency' art. 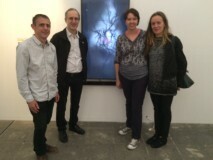 (Here they are with curators Ricardo Dalfarra and Monica Bello). The piece is called Dreams of Mice and it quite literally interprets/visualises the reveries of one particular mouse they called Ron. It reminded me of Future Sound of London record sleeves. And here's Lisa Ma, who does even stranger research. 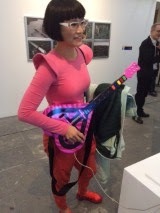 Her piece in this exhibition, called Farmification, was about the quarter of a billion migrant workers who've left their farmlands to manufacture our technology gadgets in places like Shenzhen. So who's growing the food now? She persuaded factory owners to grow stuff in their lunch breaks. I'm not sure how that connects with art, but Lisa certainly looks the part. The 'guitar' she's wielding is actually just a giant mouse, moving the screen presentation on. Doug Fishbone's Hypno Project was weirder still. A dozen people hypnotised and then responding with grunts, whoops and hand signals to words and images. (Actually, I prefer his most recent project at Dulwich Picture Gallery where he paid a Chinese artist 100 quid to copy one of the Gallery's old masters and hung it up instead of the original. The Gallery then held a competition to see if the public could detect which one was the fake). 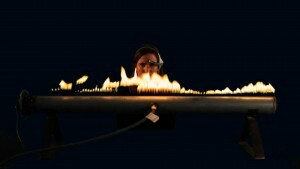 However, the work I liked most (or at least was the most immediately understandable) was Mexican artist Jaime Lobato's Burning Thoughts, a long metal bar with about 100 little flames rising out of it. Strap a receptor round your head and you can control their height through brainwaves. Art eh? And Addictive TV will close the exhibition in a week's time.